Web designers have an amazing impact on the web as they are the ones who make it beautiful. They take the sterile, rigid output from our web applications and give it nice colors and rounded corners. Front-end web design is their sphere of influence, so they are looking at new and exciting ways to enhance the web experience through a web design trifecta of web fonts, HTML5, and CSS3. As a result, blog posts and web conferences are raving about the amazing future of the web as it pertains to design. The future of the web has to be looked at from a much broader perspective than just front-end design. Elegant and responsive design backed by powerful web development concepts like rich web applications, content aggregation and curation, and APIs deliver a more well rounded vision for the future of the web. Over the next couple of years we are going to see an emergence of something new on the web, where the delivery and distribution of content on the web is going to transcend the website, the blog, social media, and mobile apps. The concept that each and every touch point is its own isolated entity and requires its own dedicate strategy is going to become an unmanageable and daunting task. The magnitude of managing all of these individual instances of our digital content is not scalable. Many people and organizations have already identified this problem and have built, or are in the process of building, solutions to alleviate this burden. They are turning the web on its head, so to speak, and focusing on central repositories of content and users. Instead of focusing on a particular touch point as an end product, each touch point is an extension of a greater whole. A website becomes an instance of a subset of users interacting with a subset of content. The same holds true for mobile apps, social media sites, and web applications. 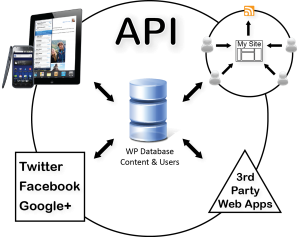 At the heart of this web strategy is a database that serves as a central repository of users and content that can be easily accessed via an API for the development of multiple digital touch points. This concept is what is driving my personal development of KickPress, a WordPress based API that allows for the development of web and mobile applications that transcend the traditional website or blog. Combining a powerful content distribution API on the back-end with a elegantly designed responsive front-end using tools like HTML5 and CSS3 will create a future on the web which doesn’t look fragmented. There can be a unified strategy for content distribution across multiple channels and digital touch points without duplicate efforts and unnecessary strain on resources.